The world’s second largest IT event, COMPUTEX 2011, will be held at in the halls of the Taipei World Trade Center from May 31 to June 4. MSI, the world-leading manufacturer of mainboards and graphic cards, will show the unrivaled power and sensational performance of MSI products. 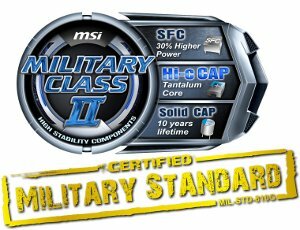 MSI will display the best of its best products at the show, including products that have passed the uncompromised US Military Standards (Military Class II Series) and the latest Intel Z68 mainboards equipped with the MSI exclusive OC Genie II technology. Also shown are the latest Military Class II AMD 9-Series mainboards, with easy overclocking and core unlocking, and the flagship-level, eight PCI-E 2.0 x16 slot, Big Bang-Marshal (B3) mainboard with premium Creative X-Fi MB2 sound processor - the best choice for gamers with its superb performance and sound effects. Although the Military Class II Standard has made MSI mainboards flawless, the new-generation OC Genie II smart overclocking technology boosts the performance of MSI mainboards far beyond the imagination. Continuing the level of accessibility of its previous generation, the OC Genie II makes OC even easier. Users can activate OC in three different ways: press the button on the mainboard; turn it on from BIOS; or activate from the OS application. In just one second, OC Genie II can unleash optimal performance from your system. The MSI AMD 9-Series will make its debut appearance at Computex 2011. Apart from Military Class II components to maintain stable operations in OC and high-load states, the MSI OC Genie II can significantly boost clock speeds and unlock cores in AMD CPUs to boost performance to 248%! The MSI AMD 9-Series also supports NVIDIA SLI and AMD CrossFireX for multiple-display - up to four graphic cards at the same time.